We are enjoying the most gorgeous weather at the moment and spent last weekend at the beach going from one bar to another to make the day lasts longer. 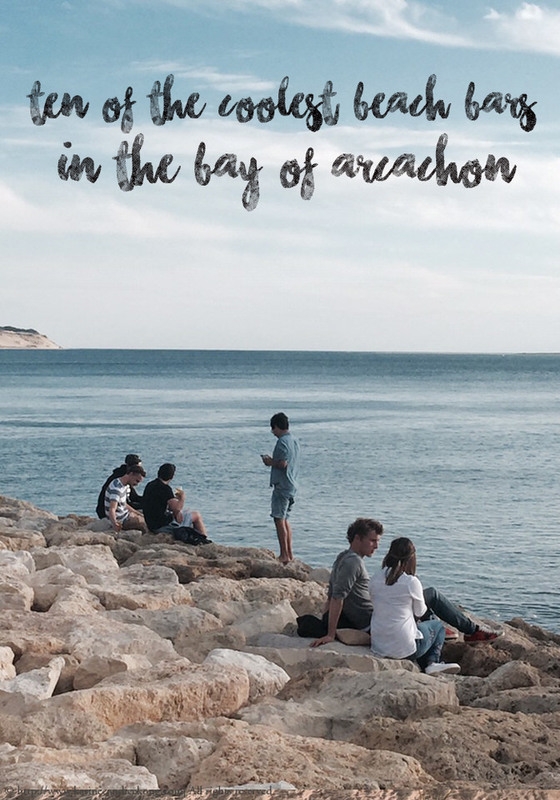 If you are planning to come to this side of the world, here are the coolest beach bars in the Bay of Arcachon where we love to hang out. I have listed 7 (all kids friendly), one to try every night of the week…Enjoy! Is my new favourite spot. With a fantastic view on the Dune of Pyla and le banc d’arguin, it’s quite a magical place tucked away at the end of a pier with nothing around except the dune, the ocean and an old blockhaus half buried in the sand…kind of a no-man’s land except they have a really cool playlist, great view on the Bay, cool vibes and nice tapas. Forget about high heels though. To get there, you need to take a long stair down to the beach and then walk on the pier or in the sand. They don’t take reservations so it’s on a first come first served basis but you can also sit at the bar, on the blockhaus or the rocks (see above) nearby facing the Bay until you get a table. It’s open from 10am to midnight but since there is no Uber in Arcachon, you will need to book your cab in advance to avoid getting stranded. Decorated by Philippe Starck, La Co(o)rniche has still the best view on the Dune, the Bay and Cap-Ferret and a fantastic deck great for parties and wedddings. The 150 staff wears white and Stan Smith and provides great customer service although they always seem to be a bit slow for bringing the bill. Now a 5***** hotel, le restaurant is good but not cheap but you can always get tapas outside on the deck and have a good time watching the sun goes down and see everyone pulling out their iphones to take a picture ;-) Personally, I think the Co(o)rniche did a lot of good to the area and brought a cool, design factor to the Bay that was seriously missing so you should really check it out. Children are welcome and Lily and Mila love playing with the giant chest game at the entrance of the restaurant. 8 min drive from our holidays home and this one, this is basically “our local”. We eat there at least once a week and more when neither Steve or I can bother cooking. It’s a fantastic, unpretentious, feel-good spot and a place, I love to go after a day at the beach. Charly, the owner is very welcoming and the food is good. It’s best to book in advance though as there is more and more people heading there to end a good sunny day. Cazaux is 17 kms away from Arcachon but so worth the trip if you want to escape the crowd of tourists. Very kid-friendly, the restaurant is right on the beach and 2 meters away from the water so children can easily swim or play while you’re drinking a Mojito. Like the Blockhaus, Club Péreire is a temporary bar set up on the beach from April to late September/October. That fact alone blows my mind because I think it’s pretty amazing to build such a cool bar for just a few months and pack everything at the end of the season. Located on “la plage de Péreire” just outside Arcachon, Club Péreire is another great place to hang out with friends until the sun goes down. Great for cocktails! Located in Port Maguide at Biscarosse, I have mixed feelings about this place. The set up on the beach is nice with big sofas and comfy chairs that reminds me of Bali but last year the service wasn’t great and the reviews online aren’t fantastic. Saying that, Steve and I had lunch there last week and the food was nice and our waitress friendly, maybe a bit pricey for a beach café but I give them the benefit of the doubt for this season. The other good thing about it is that it is next to Aquapark where Mila loves to go. You can also rent stand up paddles, pedalos and book a massage on the beach…very much like in Bali. If you’re fan of long, sanded beaches, the nicest ones on the coast can be found from the Dune of Pyla towards Biscarrosse… and include Le Petit Nice, La Lagune and La Salie (which is where you can surf). Le café/restaurant on La Lagune is a nice one to try after a day at the beach. It is open 7/7 from 10am to midnight and is open all year. A bit of a hidden gem since it’s located in the campsite of the same name and you need to get access from the reception desk but it’s worth booking a table. The food is good and the view is fantastic. It really depends on the weather and if you’re into water sports. As there is a lot of surfing, kite surfing, windsurfing etc going on off season. Most bars are opened until the beginning of November. The Blockhaus didn’t open this year but all the others are. I think Juliette is now closed on Monday & Tuesday but open the rest of the week. It was our house before but we sold it to her early Jan. and she has kept everything as it was. They don’t need lessons, but we will need to hire some boards – reluctant to bring our own as they always seemed to get damaged. Maybe Ocean Roots could help with that?